The goal in Tumble is, as you might've guessed from the name, to make your opponents take a tumble off the randomly-generated platforms and fall into the lava waiting below. You can be straightforward and try to knock your friends off, or be tricky and dig the ground out from under their feet. Minecraft veterans might recognize this as the community creation, "Spleef". 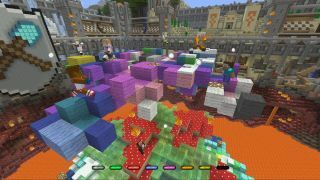 Tumble is part of a free patch that you should be able to download now on PlayStation and Xbox systems (Minecraft on Wii U will be undergoing scheduled maintenance later tonight, when it's expected to also get the update).